This section of the site shows a series of players in various weight divisions and from different countries who will be attending the 2004 Athens Olympic Games. Height: 1.83 m / 6'0"
Youssef is only a new comer to today's modern Taekwondo world but has made a massive impact in a very short space of time. His amazing performance in the 2000 Junior World Championship made him a force to be realized in the senior ranks. He did not win his first senior title until 2002 and his performance in the 2002 World Cup was stunning with an amazing 8:6 win over the Turkish veteran Bahri Tanrikulu. These two fighters met again in the semi finals of the World Championships and it was Youssef who proved to be the better player and who secured himself a place in the final to eventually win gold. He recently secured his place at the 2004 Athens Olympic Games by winning a Silver at the World Taekwondo Qualification Tournament. By winning every match (BAR ONE!) he has ever fought since he began his International career in 2000 he has definitely secured himself as the World number 1 Middle weight player. His rivalry against Steven Lopez in the Olympic Welter weight division was set to be one of the highlights of the games and with so many excellent players in his catagory, you can always expect fireworks from Youseff Karami! However it was Lopez who triumphed in the end during their semi-final (which should have really been the fial) leaving Karami trailing for an Olympic Bronze. However at such a young age Gold at Madrid and at Beijing is defenitley within his abilities. 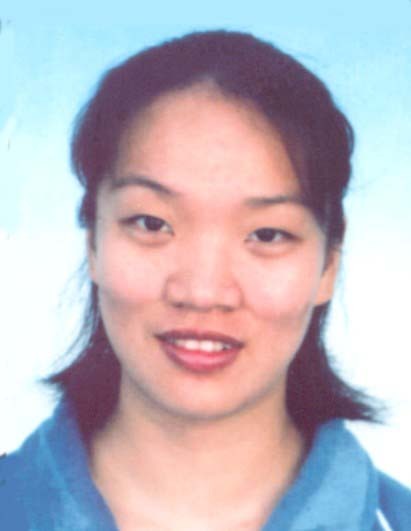 Height: 1.80 m / 5'11"
Luo Wei first burst onto the international competition scene with a major gold medal win at the 2003 World Championships. In the World Olympic Qualification tournament she outwitted the very experienced Kim Yeon Ji of Korea in the final to take the gold and secure her place in the Games. With her height and long legs, she instantly became one of the hot favourites for the Olympic gold at the tender age of 21 with her only real threat coming from the Korean Olympic Team. However she beat the Korean candididate in the 1st round and progressed onto the final with a very interesting final match against Mystakaidou of Greece. She will be a hot contender for her second world title next year. Elisavet Mystakidou has been quite an unknown player outside of her home country of Greece until she won silver at the recent 2004 Olympic Games. 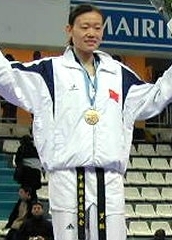 She has won countless medals for Greece in the past some of which include both European and World titles. However in her long Taekwondo career which began in 1989, she has only ever won one career gold medal whcih was at the European Championships (in Patras, Greece) in 2000. Her style of play throughout the Olympics was superb and in her final match she showed she was not intimidated at all by the up and coming Wei Luo of China. She has been mostly successful in the latter part of career to date with countless medals across the board but with an Olympic silver around her neck she has achieved more than others could ever dream of. Hwang Kyung Sun was another member of the Korean Olympic team who, despite inexperience has proven that sh can win medals. She was beaten in the first round of the Olympics by a very confident Wei Luo of China but won the bronze by progressing through the repechage stages. Although she is not as old and experienced as Kim Yeon Ji she did beat her twice proving that she was the best that Korea had to offer at the Athens Games. She has time and age on her side. Height: 1.91 m / 6'3"
Moon Dae Sung is an excellent Korean competitor who has constantly been under the shadow of Je Gyoung Kim for many years. However since his retirement in 2000, it has been Moon who has taken over the the Korean National Team number 1 spot. Moon, who is a member of the famous Samsung S1 team, is a major player on the Korean domestic circuit and began competing internationally on the world stage in 1996. He was unfortunate to miss out on a place on the Korean Sydney Olympics team but made up for this by winning the 2003 World Olympic Qualification Tournament and secured his place for Athens. He didn't get a medal at the recent World Taekwondo Championships as he lost in the preliminaries by decision to Denmark However despite this with a career high of 6 Gold medals, he has definitely secured his place as the number 1 in the World for Heavy weight Division. He was one of the favourites to win the Gold at the Athens Olympics with only two opponents from France and Denmark standing in his way. However on the day he prevailed beating Pascal in the semi finals and winning the final with a stunning reverse turning kick (bandae dollyo chagi) KO on Alexandros Nikolaidis. He hasnt won the World Championships since 1999 so if he does decide to play in Madrid we may see anoth Gold around his neck. However if he retired now it would be at the pinnacle of his Taekwondo career. Height: 2.00 m / 6'7"
Obviously from Looking at Alexandros' results one can see that his career high has of course been in 2004. He is a very tall competitor who often overshadows a great number of his competitors. He has a very long leg length which is often used against himby many of his small counterparts. He plays quite frequently in most international competitions and he is often seen at many of the european Taekwondo Opens. With a win at the World University Championships and a win at the Olympics it is a great start for him to go on campaign for both both a World Championship and Universiade Championship medal next year. However whether or not the KO he recieved in the final of the Olympics has killed his confidence, remains to be seen! Height: 1.98 m / 6'6"
Pascal is an excellent European player who has constantly been under the shadow of Je Gyoung Kim for many years. However since his retirement in 2000, it has been Pascal who has taken over the scene. 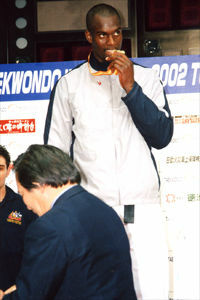 Pascal began Taekwondo at the rather old age of 18 and began competing on the world stage in 1994. He was unfortunate to miss out on a final placing in the Sydney Olympics but made up for all his losses by winning the 2000, 2001 and 2002 World Cups consecutively. He didn't attend the World Qualifying rounds for the Olympics in Paris, but attended the European Qualifiers instead and took the gold to qualify for Athens. With his experience from the Sydney Games under his belt, he was tipped to be the main gold medal contender for the Athens Olympic gold medal. However he was beaten by Korea's Moon Dae Sung in the semi's and went on to take the bronze in the repechage. 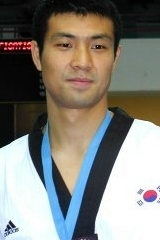 He has never won a World Taekwondo Championship gold with his best effort in 1995 being a silver. It maybe a possibility that we will se him in Madrid next year but he may retire after his Olympic bronze. Chen Zhong is another consistent and talented young female Taekwondo athlete. At the age of 21 she has already achieved what most can only dream about and she still has plenty of time yet. Formerly a professional basketball player before becoming a Taekwondo athlete she has moved up a weight category of late but still fights as a middle weight as well. She qualified again for the Olympic Games at Athens and made it Olympic Gold number 2 a record only ever equalled by one other female taekwondo competitor (Lee Sun Hee/Korea) With the Olympic gold around her neck expect to see her working her way to a World Championships gold medal in Madrid next year. Height: 1.74 m / 5'9"
At the young age of 23, there is still plenty more action to be seen from Myriam Bavarel of France. Her performance at the Athens Olympics was impressive with a host of kicks available in her arsenal. She only really came onto the international scene in 2000 with a bronze medal win at the World Cup which was held in France. She played well at the 2003 World Championships losing out on the goild to China's Wei Luo. She also played well at the Olympics, losing out to Wei Luo's heavier counter-part Zhong Chen of China. With a host of medals of whcih are all bronze and silver, maybe next year she will feel it is ready to add that illustrious gold to her already great medal collection. Height: 1.78 m / 5'10"
Adriana Carmona began her career in the early 1990's when she won her first medal at the 1992 Pan Am Championships. Since then all through the 90's she was a regular medal winner up until 1998 when she won silver at the Pan Am Championships. From 1998 until the 2004 Olympics she didn't win any medals at all with her best result in that time being a quarter final defeat at the 2003 World Championships. She has only ever won 1 career gold in her time as a player but her Olympic bronze is sure to mean more to her than any of the other medals in her collection. Whether she will retire or compete at next years World Championships in Madrid remains to been seen.